The Creative Spirit in Doctors: Medicine’s Two-edged Sword. Over two full and very busy weekends in March, about 600 young people from across Canada are invited to Queen’s to apply for admission to our medical school. As they do so, they are welcomed, guided and encouraged by our first year class. Part of their welcome to our school is a video they screen for the applicants and their families, intended to entertain, but also to give some sense of our values and identity as a school and community. That video, essentially a fairly sophisticated mini-musical, is written, performed and produced entirely by members of the first year class. In fact, almost every member of the first year class is involved in some way in the production process. 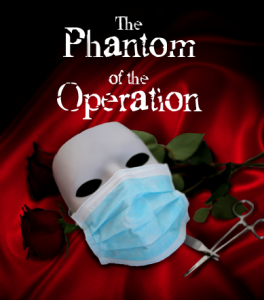 Later this week (April 7th and 8th – get your tickets), our students will be putting on the latest version of Medical Variety Night “The Phantom of the Operation”. Anyone who has attended one of these productions in recent years will realize it has become much more than satirical commentary and slapstick humour (although both are still very much in evidence). MVN has become a showcase for the considerable musical and creative talents of our students, from sophisticated dance to rather impressive musicianship. In fact, as you get to know our students, you will find that a surprising number of them have deep interest and maintain active involvement in artistic pursuits. In many cases, there’s almost a reluctance to admit to such interests, perhaps fearing it may suggest a lack of focus or dedication to their burgeoning medical career. ODNT members Drs. 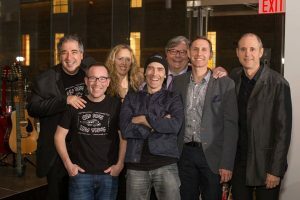 Adrian Baranchuk, Gordon Boyd, Rachel Holden, Jim Biagi, Gerald Evans, Chris Frank and David Frank. have combined their musical talents to form “Old Docs, New Tricks” which, it seems, brings as much satisfaction to the performers as those they entertain. I happen to know a certain department head and accomplished career scientist who is a remarkably gifted classical guitarist. A cardiovascular surgeon acquaintance of mine “moonlights” as an operatic tenor. Even if not actual performers, many of the great physicians I’ve encountered and gotten to know well over the years have deep appreciation for literature, music and the arts. This shouldn’t come as any surprise. 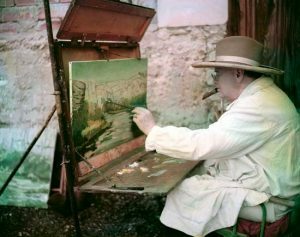 Winston Churchill possessed a remarkable creative energy that found expression in multiple ways. He was a prolific amateur painter, and also enjoyed bricklaying fences, gardening and breeding butterflies at Chartwell. His two great literary contributions The Second World War and A History of the English Speaking Peoples read not as dry historical accounts, but as personal memoirs written in a highly engaging narrative. Scratch the surface of greatness, it seems, and an artistic temperament usually emerges. Whether it is conveyed in music, words, or scientific innovation, the expression of new ideas, or interpretation of existing ideas in fresh and unexpected ways, is the essence of the creative process. This does not apply only to research. Because every patient and every clinical situation presents unique challenges, the effective physician is required to continually develop creative approaches. Our best administrative minds are able to “think outside the box”. Algorithms, practice guidelines and standard approaches can only take us so far. It broadens our appreciation of the human experience. Creative art, in any form, is fundamentally an attempt to express some aspect of the human experience, and hold it up for all to see, consider and learn from. David Skorton, a cardiologist (and jazz flautist) who is currently head of the Smithsonian Institution perhaps expressed this best in an impassioned keynote address at the recent annual meeting of the American College of Cardiology entitled “Medicine Needs Art to Flourish”. Those truths, I would argue, are critical to the practice of medicine. So the advantages seem obvious. 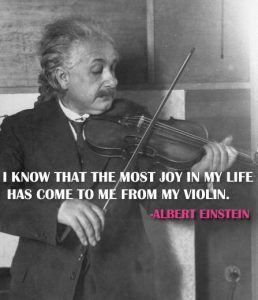 A creative mind and artistic spirit provide an ideal starting point and are quite probably essential to learning and practicing medicine. It could even be considered quite natural that creative thinkers will be drawn to careers in medicine. But, as with most natural processes, there are counterpoints, or consequences to consider. The artistic spirit follows its own path and naturally resists external control. Since the profession so often attracts these free and independent thinkers, developing consensus and unified approaches to controversial issues can be hugely challenging. This reality is in rather public and painful display in Ontario at present and, I’m sure, at any department or practice group meeting. Doctors will never be found marching lockstep for any cause, or at least not for long. Leadership within the medical profession is therefore a considerable challenge for those who bravely take on such positions. To be effective, that form of leadership must be much less about exerting authoritarian control and much more about harnessing and nurturing the considerable creative and highly-motivated energy available. That harnessing and nurturing takes interpersonal skill, patience, energy and self-sacrifice, a rare but very valuable combination of attributes. The other unfortunate consequence of an artistic spirit engaged in work that demands high level performance of repetitive tasks is restlessness. Creative minds require continual and changing challenges. Put simply, they get bored doing the same thing, even if that thing is critically important and demands perfection. Failure to recognize this, I would conjecture, leads to job dissatisfaction and what we might identify as “burn out”. On the other hand, recognition of this issue by both the individual and those in leadership positions can provide opportunities to harness that creative restlessness and use it to great advantage, salvaging careers while strengthening groups and institutions. So the artistic temperament can truly be regarded as both a great advantage and potential liability for the profession. Like the metaphorical two-edged sword (or scalpel), it can be very effective, but must be grasped carefully and handled skillfully. 4 thoughts on "The Creative Spirit in Doctors: Medicine’s Two-edged Sword." Hi Tony, another great blog that I enjoyed. I can’t resist the opportunity to include Sir Ken Robinson. His TED talk on creativity has been one of the most watched TED talks https://www.ted.com/talks/ken_robinson_says_schools_kill_creativity. As a recent new student of the saxophone, I fully agree that such activities can promote wellness, and help to bring balance and wellness in our medical professions. Sometimes creative minds and artistic spirits tell us so much about an experience that perhaps other means cannot. I am a huge fan of your idea that we must use considerable skill to harness and nurture creative spirit and not be authoritarian or didactic. In my experience that squashes creativity and breeds resentment. Accepting more than one way to express oneself, is a great leadership trait.